Composed between 1983 and 1985, Amanda Berenguer’s celebrated collection La Dama de Elche (The Lady of Elche) showcases her mature writing. Berenguer (1921-2010) resided in Uruguay, and the book is well known there. Yet La Dama de Elche was first published in Madrid in 1987. As a result, while Berenguer and her book are both associated with the Southern Cone, the publishing history of La Dama de Elche is transatlantic. The translation of literatures amongst the Americas is not reducible to North/South axes. It is true that N/S divides are relevant on many levels, not least because divisions are so often preserved, remade, and even heightened under contemporary forms of globalization. Yet the translator often encounters one or more factors triangulating the geography of a project out of this hemisphere alone. Transatlanticism, for example, introduces East/West axes of material and conceptual kind. The publication of La dama de Elche in Spain came about because Berenguer entered her collection in a contest, the Premio Extraordinario de Poesía Iberoamericana, sponsored by the Fundación Banco Exterior. The judges found her book excellent. Unfortunately the competition was structured to be anonymous. Berenguer outed herself in the first line of her second poem: “I’m Amanda – from Montevideo –“ (“soy Amanda –montevideana—“). Just in case anyone didn’t know who Amanda From Montevideo was, her second-to-last poem “day of rain” (“día de lluvia”) ensured that they would collide with her surname. that circle the city with minarets? que rodeaban aquella ciudad con alminares? con el asentimiento de las altas palmeras? Easy enough to see how the anonymity requirement would be a problem. The Foundation published Berenguer’s book anyway, naming her a finalist. 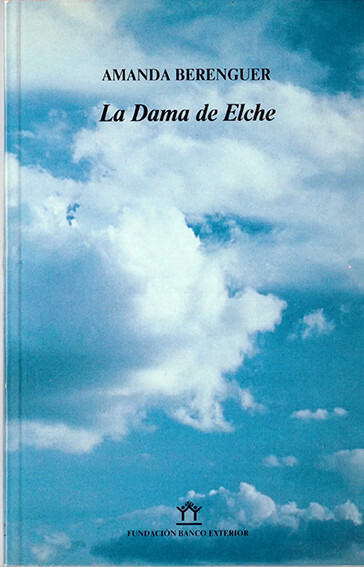 La Dama de Elche was then reprinted in Uruguay, where it won three significant prizes for poetry. Today it is considered one of Berenguer’s great achievements, and she herself is one of Uruguay’s canonical “Generation of 1945” writers. As the line about a Berenguer “lord of Elche” demonstrates, the content of the poems reinforces the transatlantic geography of the book’s publication. Ramón B’s emphatically Hispanic urine, originating centuries ago in the village of Elche, crosses into late-twentieth century rainfall to land in a Montevideo garden. The poet’s insistence on publishing her names thus serves a purpose uniting the complete book. It upholds a quest for origins across time and space, used to forge trippy intersections between the spaces of ancient Greek literature and contemporary life in the Americas, including the streets and skyscrapers of New York. Berenguer’s weird title poem also reinforces the reach and implosion of her transatlantic geographies. She named La Dama de Elche after the Lady of Elche, an object both suggestive and unexplained. Loosely dated to around 450 BC by most experts in Spain, the Lady is a sculpted bust dug up in the village of Elche in 1897. It has been displayed in such institutions as the Louvre and Spain’s national archeological museum, as well as the Prado, and for many viewers the Lady is a cipher for an ancient, lost Iberian culture. Literally dug up out of the earth, the Lady became an excellent and usefully obscure image for Iberian identity at a historical moment when Spain needed to replace its lost imperial symbols with something homegrown. That is, its empire abroad had collapsed, so twentieth-century Spain needed to reimagine its identity in landlocked terms. It is not clear who the Lady is (“she” may even be a man). Some speculate that the figure represents a priestess or member of a royal family, and the artistic lineage of the statue is contested. One daring art historian from the United States, John Moffit, even published an entire book in the mid-'90s dedicated to the sacrilegious claim that the Lady is a hoax. In his argument, the ambiguous stone bust is not representative of a deep Iberian past but of modernism’s love affair with lost artistic pasts, which coincided with Spain’s profound need for new images on which to prop its nationalism. Berenguer focuses on specific aspects of the Lady in her title poem: a descent into the earth, textures of dirt and stone, details of the Lady’s still-undeciphered stylistics (including the “auriculars”: buns of hair or round accessories by her ears), and the implosion of historical boundaries that the figure of the Lady enables for the speaker/viewer. Wherever the Lady might or might not originated in reality, Berenguer taps her image in order to tap into a modernist fascination with archaic aesthetics, as well as a search for cultural connections similar to the one that had helped to propel the institutionalization of the actual Lady of Elche sculpture in Spain earlier in the twentieth century. The poems in the book are carefully placed to suggest a quest -- more specifically, a set of visionary travels by minds and bodies. Melding the distant past into her present, Berenguer draws on (and openly cites) classic imagery to suggest a cycle in mythological form, complete with descents and ascents through time and space. La dama de Elche concludes with a poem evoking the search for the origins of poetic language itself. Ugly Duckling Presse will be bringing out an anthology dedicated to Amanda Berenguer's poetry. Entitled Materia Prima, it is coedited by Kent Johnson and me. The anthology will include the poem discussed above, as well as excerpts from a series of different books showcasing Berenguer's masterful range. Translators include Gillian Brasil, Anna Deeny, Urayoán Noel, Jeannine Pitas, Alex Verdolini, and the co-editors. Johnson previously co-edited Hotel Lautréamont: Contemporary Poetry from Uruguay with Roberto Echavarren. Poems by Berenguer appear in translations by Mónica de la Torre. The poem is called “Avec les gemissements graves du Montevideen.” The complete English rendition of this poem appears in Lana Turner 7 (2014). Golden Handcuffs Review published the English translation in issue 1.16 (Spring-Summer 2013). Berenguer apparently saw the bust while it was installed at the Prado – her title poem refers to galleries in that museum.